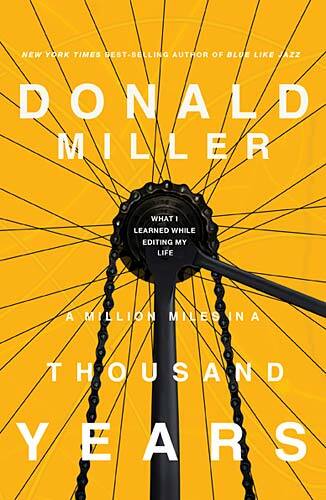 I previously wrote a review of Donald Miller’s book “A Million Miles in a Thousand Years.” You can read that review here. This entry was posted in Books, Story and tagged A Million Miles in a Thousand Years, Donald Miller, Story, Storying on January 18, 2013 by John. Storying is a well-established practice used by missionaries in the non-Western world. In non-literary or oral cultures story-telling is the normative manner in which information is taught and cultural and religious values and beliefs are transmitted. Stories are simple, repeatable and often told. In the last 100 years (as far as I can work out) there has been a growing realisation that this is the best form of discipleship and evangelism in these cultures. In the last 20 years or so there has been a growing realisation that story and story-telling is a methodology not just for the non-western world but one that is equally at home within a changing western world. And we have seen the rise of storying within the post-modern, young, organic, emerging, cynical western church. As with all movements storying is a mixed bag- some use it as an alternative to objective truth, Biblical inerrancy or authority of elders. But I am an evangelical, comfortable with objective truth, subjective interpretation and hold to the Bible as the inerrant, sufficient, authoritative and inspired word of God. Although the Bible contains different genres and many different human authors it all works together to tell one story. The Bible clearly attempts to give us a meta-narrative (big story) through which we may understand our own place in the big story. It has a clear beginning and moves throughout a drama set over thousands of years to a climax with the coming of God’s King towards an as yet unresolved but anticipated ending with the renewal of all things. Interwoven into this big story are hundreds of little stories, laws, poems, songs, sermons and well thought out rational discourses, which all find their context, depth and significance when they are seen within the big story of the Bible. Much has been written of the success of storying in non-literary (or non-literate) oral cultures. The majority of people in our country are non-literate learners; they are oral rather than literary learners. Oral learners learn best through stories and proverbs. They enjoy learning in groups, reason intuitively, think holistically, are comfortable with repetition, value traditional knowledge sources (such as community elders) and integrate their learning relationally. For non-literate and oral learners even an interactive Bible study can be intimidating and feel like an English comprehension exercise. The majority of theological education in South Africa is conducted in a highly literary context in order to equip for ministry to an assumed literary (or even literate?) people. If we wish to reach and disciple effectively in our country we have to reconsider the primary learning styles of our context. Increasingly the western world is becoming functionally non-literate, particularly among younger people and non-university educated people. The functionally non-literate are those who can read and write but who rely solely on non-literary sources for their information and everyday functioning. The technology explosion, and in particular the internet and social media has created a new non-literate people group. They get information from television, Youtube and social media sites such as Facebook or Twitter. When they do read it tends to be online through blogs, news sites or web pages. Storying has the potential to connect with both the more traditional African culture as well as the new technologically driven functionally non-literate westernised culture. Great stories disarm you, get behind your prejudices and carry you along to an ending that dumps you on a foreign shore re-evaluating all you once held dear. We have lost the wonder of story because we are surrounded by too many non-stories. We are to once again proclaim the great story and call others to come and join their story with the Great Story. We have lost The Great Story and so have lost our own story. We have grown used to asking “Where does God fit into the story of my life?” when the real question is where does my little life fit into His Great Story. Tim Chester: “Bible Teaching in Missional Perspective” Porterbrook Network (Advanced Year Module); Unit 6: Introducing Storytelling, p40. This entry was posted in Cape Town, Story, Woodstock and tagged Africa, Christopher Wright, Contextualization, Donald Miller, Great Stories, J.O. Terry, Narrative, oral cultures, Orality, Story, Storying, The Great Story, The Story, The Story of God, Tim Chester on January 15, 2013 by John. Dare I say, “Blue Like Jazz” was a once in a lifetime book? It was the right book for the right time with the right tone. A writer probably only has one such book in him, if he is lucky. Donald Miller is on a hiding to nothing trying to write a follow-up. Readers now come armed with those most evil of emotions for writers and film-makers high expectations. They are looking forward to more of the same experience that Miller previously delivered in Blue like Jazz. And “A Million Miles in a Thousand Years” does not deliver and in fact it was cruel of me to expect it to. It is exactly this blight of “quick success” that has put Don Miller in the slump we find him in at the beginning of the book. The book cleverly follows three inter-related threads- the nature of life as a story, Miller’s own search for a better story and the writing of “Blue like Jazz”, the movie script. The main idea of the book is that each of our lives are a story, some of us live great stories and some of us live terrible stories or non-stories. Throughout the book Miller explores this nature of story through the writing of the screenplay which is mirrored in his own search for a better life story that the slump he is currently in. Miller is a great story teller and he had me cheering him on, laughing out loud, furiously underlining, inspired, frustrated and even shedding a tear at one point. Miller’s search for a story leads him to hike the Andes, kayak the Jervis inlet, cycle across America, found a mentoring organisation for fatherless kids, find love and lose love again. Story has been a theme I have been thinking about quite a bit lately and I picked up this book eager to see what Miller’s unusual way of looking at the world brought to this theme. I must confess that apart from the chapter entitled “The Reason God Hasn’t Fixed You Yet” which is quite brilliant, I found the book “Jesus-lite.” I am not sure what Miller’s reasoning behind this was, as he speaks quite clearly and unambiguously when he does speak of Jesus. I found it particularly unusual given that the great story he seeks and which he speaks about is so clearly fulfilled in Jesus. He briefly touches on this but I was honestly surprised he did not explore this more. It would have given the book a greater punch and a greater depth. In the end what could have been a really great book ends up being a bit fluffy with some great scenes without really going anywhere. Dare I say that Miller fails somewhat to do what he explores throughout the book- write a great story? This entry was posted in Books, Story and tagged A Million Miles in a Thousand Years, Blue Like Jazz, Book Review, Donald Miller, Story, Storying on January 8, 2013 by John.